In the English Rankscale, the Sentence is the largest grammatical unit and, by definition, it refers to a group of words that begins with a capital letter and ends with any of these three punctuation marks: the period or full stop, the exclamation mark and the question mark. 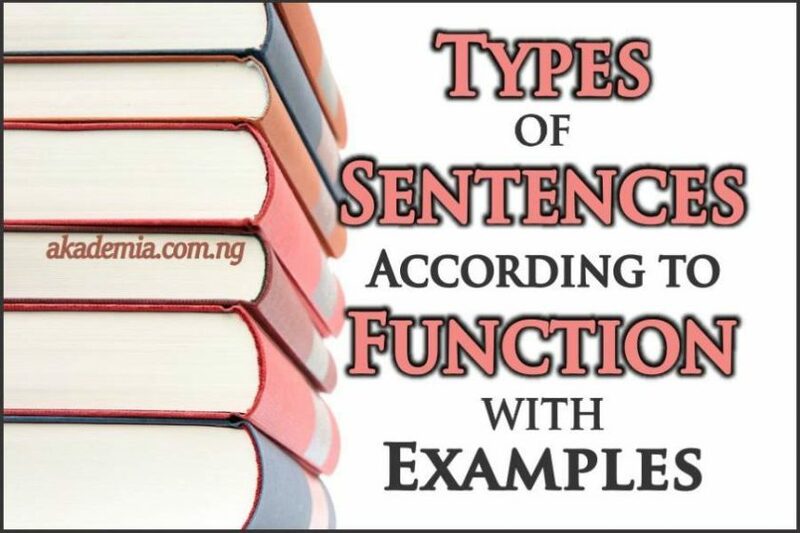 This post, Types of Sentences According to Function with Examples, examines closely the different types of English sentences based on functions using copious illustrative examples. The classification of the English sentences is in two forms. We classify sentences based on their syntactic classes or their structural appearance. Another classification has to do with the functions English sentences perform. So we have structural and functional classifications. I have put together a post on the Structural Classification of English Sentences. But here, I will focus on the functional classification of sentences. Let us see the various types of sentences using the function parameter. The man has just gone out. The class over there is making a noise. She is an accomplished writer. We ate samosa for lunch. Let us move over to the field. The sun is the centre of the Solar System. I hope we can get home before nightfall. How I wish she was here. The American astronauts are in space. The governor has paid the salaries of workers. There is a pattern for the formation of a declarative sentence. In its formation, the subject comes first and the predicator follows it immediately. In other words, the declarative sentence is the basic form. The basic form of a sentence is when the subject comes foist and the predicator follows the subject immediately. E. g.
The president has disbursed the money. This type of question requires yes or no for an answer e.g. Are those girls reading their books? Is the programme ending today? Were they around this morning? Take note that at the end of the question, the voice pitch rises. How has life been with you? Why have you been away from work? When are we planning to leave the party? Whom did you give the letter? Who can we get to help us? Under what conditions have the prisoners been released? Unlike the polar question, which has the possibility of only two answers, that is ‘yes’ or ‘no’, ‘wh’–question permits broad or open-ended number of answers. Note that the voice pitch drops at the end of the question. This distinguishes it from the Polar Question among other things. In forming this type of question, the Q-word (what) comes first, the operator (the auxiliary verb) follows, the subject comes next, then the lexical verb and the adjunct. Wasn’t that a scintillating performance! The syntactic formation is S-op inversion (subject-operator inversion) like the Polar Question. The man has arrived, hasn’t he? They are not here, aren’t they? The candidates passed the examination, didn’t they? The question is formed from the statement using the subject and the operator; the syntactic formation is a subject-operator (S-op) inversion. In English, which has a broad range of tag questions, the choice of tag question depends on the grammatical form of the statement. You have arrived, haven’t you? She is not back. Is she? They are swimming, aren’t they? We were asked to pay, weren’t we? He should not say that, should he? The dog likes to bark always, doesn’t it? The designs came out well, didn’t they? We live in an age of information, don’t we? We have not met before, have we? He is a jolly good fellow, isn’t he? The meeting won’t take long, will it? The children should eat now, shouldn’t they? What a wonderful event this is! What kind of a person he has turned to! What a strange sight they saw! How skillfully he dribbles the ball! What a mess they are in! How I used to enjoy myself in those days! (the EX-element ‘how’, an adjunct, comes first, then comes the subject, predicator, the complement intensive and the adjunct respectively. Get out of here now! In the syntactic formation of an imperative sentence, the subject is deleted and an imperative verb is used. EU’s Brexit stance about to splinter? Super Eagles in a 2-0 victory! No plans to sack workers. Milo: Food drink for future champions! Where are you travelling to? Lagos. Most responses to questions are somehow minor sentences. A square pass to Ronaldo. Dribbles two in a row. Primary interjections which have only one lexical element such as Hurray! Wow! Ah! Oh! Etc. and Secondary interjections which have more than one element such as: Bless you! Thank God! Thank goodness! Good heavens! Oh dear! Etc. It has been a quite interesting discussion on the functional classifications of English sentences. I am sure you will be able to classify any sentence you come across based on its function. Right? Great! I think I finally find a detailed discussion! May I know who is the author of this I would like to cite this in my dissertation. Sorry. I just read your personal details. May I just know your date of publication? I have read so many content on the topic but this piece of writing is actually a pleasant post, keep it up. Admiring the hard work you put into your website and in depth information you offer. It’s great to come across a blog every once in a while that isn’t the same out of date rehashed information. Fantastic read! I’ve bookmarked your site and I’m adding your RSS feeds to my Google account.